Remember the good old days when a white towel was easily mistaken for a Super Hero cape? Marvel: Super Hero Squad is bringing us those memories, and now we can co-op with a buddy! Whether you're gaming with a friend, sibling, child, or parent, Marvel: Super Hero Squad will have you running around your living room pretending to fly with Thor's hammer anytime. Okay, perhaps we need specifics to get really hyped for this one, especially after the anticipation behind Marvel: Ultimate Alliance 2. 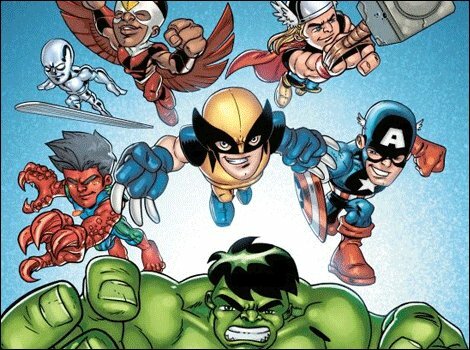 Marvel Super Hero Squad is a co-op brawler on the Wii, with cartoon Marvel characters that resemble the toys of the same name. Super Heroes from Captain America to The Incredible Hulk will take center stage to bash the snot out of some villainous goons like Dr. Doom and his cronies. Gameplay-wise, Kotaku noted a bit of imbalance while playing as The Incredible Hulk. His slow movement had him at a disadvantage every time he faced off against Wolverine. Hopefully being labeled "in-production" will give THQ time to balance all of the characters, so we get a fair run with every one of them. Otherwise, the camera is a bit odd for a brawler, sitting over the shoulder in a standard 3rd person perspective. Hopefully this wont hinder the simple gameplay mechanics that will be user friendly for gamers of all ages! Keep an eye out for Marvel: Super Hero Squad on the Nintendo Wii October 20!